Home > Solar Power News > RoofJuice: The new way to access solar power? RoofJuice: The new way to access solar power? Solar power is something we've all heard of and we are aware of the benefits – so why aren't more of us taking it up? Some might argue that there simply aren't enough incentives out there, although there is some debate over just how true this is. 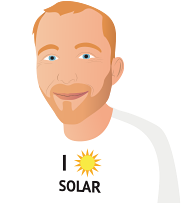 There are various ways in which you can get paid for your solar energy – we all like to receive some sort of reward for our efforts, right? Adding to the already diverse range of incentives is a product courtesy of Lismore-based solar panel installer Nickel Energy and San Francisco's Sungevity…and it's known as RoofJuice. Aside from its slightly random name, this program actually offers some pretty good reasons for installing solar power systems, as it apparently leads to instantly cheaper electricity bills. At a time when power prices are on the rise, this could be welcome news, as RoofJuice claims to protect us against those nasty cost increases. Electricity is provided at a fixed rate, so the next time the major suppliers announce a price rise, you needn't worry for your personal finances. The people behind the product realise that the cost of installing solar panels can be off-putting, so they've eliminated that upfront cost. They will supply the system and sell the power that it generates back to you – if you should generate more than you're able to use, you can claim the income from the excess. Not only that, but Nickel Energy will guarantee the performance of the solar power system, so worries about maintenance costs can be a thing of the past. You might be asking yourself where you can sign up, but as always there is one snag…it's only currently available in New South Wales and Queensland. Still, it might be worth a shot if you're living in the right area – just make sure you do your homework first!